Bilgin production grows year after year. The Turkish yard launched four yachts in 2010, their flagship Tatiana this Summer, and three other major projects are under construction. 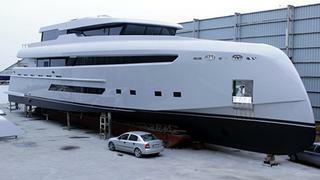 The news arrived last week that the 40m project M was rolled out of the shed. We anticipated a launch soon but, after a discussion with Yildirim Bilgen, the Sales Manager of the yard, we learned that we'll have to wait a little longer to admire M on the water. He confirmed: 'We have decided not to launch any of our yachts in 2011; instead we'll prepare them for a relaxed launching in April 2012'. This also includes Antinea, the first Classic 160 which is in the final stages of fitting out. As reminder, M is a 40 metres modern motor yacht designed by H2 Yacht Design. Her sharp lines and her reverse bow make her very different, as you can see on the picture. Her interior, also designed by H2 Yacht Design, will accommodates 8 guests in a master and three double cabins. Her twin 2,400hp MTU engines will give her a top speed of 20 knots and a cruising speed of 16 knots. Antinea is a 48.7m classic gentleman’s yacht built in steel and composite. Her interior layout will accommodate 12 guests in six cabins. On the technical side she's powered by twin 700hp MAN engines giving a top speed of 13 knots and a cruising speed of 11 knots. Both yachts are for sale through YPI. M was moved also to leave space for another Classic 160 already under construction. The hull of this one is already finished, and her construction is well under way. Also, there are rumours in the air about a pending deal for another yacht, but no details have been confirmed by the yard for the moment. No doubt 2012 will be a another busy year for Bilgin Yachts.